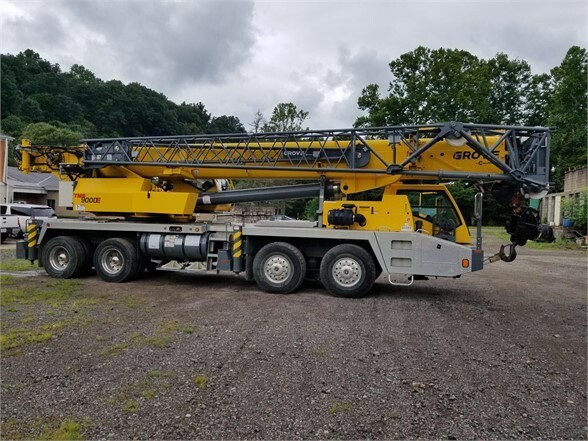 Take a look at this 2014 Grove TMS9000E. It is Stock# 5011811 at TruckerToTrucker.com. 2014 TMS 9000E 110 ton crane with every option ready to work. - New annual inspection, expires Feb. 2019. - 48,500# XL Counterweight package includes cheek weights. - Five section full power boom with Twin-Lock pinning system. - Includes 33'-56' bi-fold swingaway lattice extension. - Tiltable upper superstructure cab. - A/C upper and lower. - Auto greasing system. -Main Auxiliary hoists 3/4 wire rope 35 x 7 rotation resistant (17,160# single line pull). - Cummins ISX 11.9 six-cylinder, turbo-charged and after cooled diesel engine with less than 2,500 hours and less than 6,000 miles. - Roadranger manual transmission 11 speeds forward, 3 reverse. - March 29th full service, all fluids and filters. New batteries installed in March 2018.